Sunday brunch 11am-2:30pm, and dinner 5:30pm-10pm. Cru is a casual restaurant with a nice intimate low key vibe. It's decorated with warm cozy colors and a stained polished concrete floor. The lighting is dim, soft, warm and inviting which had me feeling very comfortable. 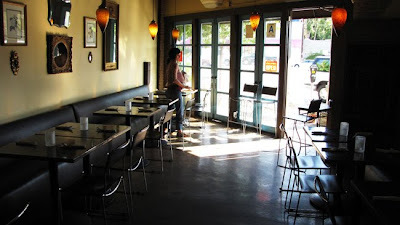 The seating was simple with a long cushioned bench along the wall with simple sleek chairs across the tables. Each table had a candle votive and simple vase with charming Gerber daisies that my friend couldn't resist putting behind his ear! The restaurant was fresh, clean, and well maintained. Even the bathroom was clean, which always gives me creepy vibes if I go into a restaurant bathroom and it is a wreck. It always leaves me wondering how the kitchen must look behind closed doors. It can be very unsettling, but in this case I was happy to see it was tidy and clean. We were greeted and seated right away. There are some raw restaurants where the service is less than stellar or the restaurant seems understaffed. However, I was pleasantly surprised by the attentiveness as well as the prompt service. Not only was the food served in a timely manner, but the servers were very approachable and friendly. They really took the time to go over any questions that we had. It was so refreshing. This approx 12 oz. nourishing juice was very refreshing with a nice subtle sweet, crisp, clean flavor. The ingredient ratios were perfect, not too strong, not too sweet, not too tart, just right. We ordered the large to share which was a very generous & filling portion. 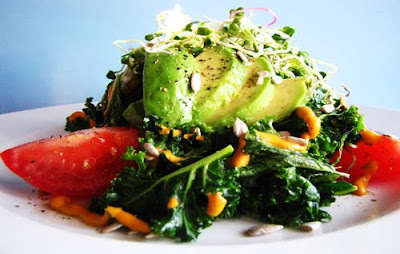 The salad consisted of kale, tomato, avocado, sprouts and sunflower seeds. The chili lime dressing was outstanding. The menu showed that this dish came with sunflower seeds, however ours came with pine nuts which I prefer anyway. I loved the different textures and all the flavors mixed well together. Kelp noodles topped with sprouts, chopped almonds, radishes, cucumbers and drizzled in the prefect amount of almond, chili sauce. This dish was so good! I really like spicy food so I might have asked for a side of minced jalapeno or some more chili, but to the regular guest it was perfect as it is. I will definitely be back to have this one again and again. No joke I am still thinking about this dish days later! I wish I had a photo of this dish, it was truly beautiful. The wrap was made of white, thinly sliced root veggie (I wish I knew what it was, perhaps jicama) stuffed with herbed cashew cheese and topped with a pumpkin seed pesto sauce. It was wonderfully accompanied with a spicy arugula salad. I really savored the flavors in this dish. I suggest you eat this dish really slowly to get the full effect of the herbed cashew cheese! The portions were so generous that we were able to share all the dishes and even save half of it to enjoy the next day. All the dishes were very filling. Organic raw food is always going to be a bit pricier than a standard cooked restaurant considering the labor and quality that goes into the food, however the value matched the prices. One thing this restaurant seems to do well is to let the flavors merry together so that the dishes are full of flavor without seeming like the dishes were rushed. You could tell each dish was made with love and care and isn't that what you want when you go out to eat? BTW, I tend to eat very simple fare (mostly mono foods) most of the time and my tummy can get a bit upset with all the complicated food combinations however I did not experience any "weirdness" with the combinations. Perhaps because we passed on the desserts. I highly recommend checking Cru out. The only drawback I experienced was parking. We had to walk a short distance to the restaurant, passing a small pack of gated in yapping Chiwawas. ;) but I know that I will definitely be back to try other menu selections. I will definitely have to munch on those amazing Asian noodles again too! This is a place that you can bring raw curious people to as well especially since there are gluten free cooked dishes on the menu as well. I went to Cru early Spring last year. Agreed on everything you said, it was so peaceful there. My friend and I ordered the same entree, so I didn't get to experience a wide variety, but it was still delish! We ordered the Collard Pesto Wraps that came with sweet potato crisps. I have to say though, the pesto in the wraps wasn't very pesto-y. That was my only complaint. Not enough basil :( Then we ordered a scoop of their vanilla ice cream. Very nice flavors! Thanks for the review of Cru! I've been wanting to check it out. Will have to try it soon. Lori!!!!!! I love you! It was really fun to hang with you last night at Au Lac. If you need any photos let me know, I will be posting on it soon! PS You look great, no need to fret over weight!!!! Wonderful blog and thanks for the recipes and ideas too. Nice review, Lori. I've got to find raw food places in NYC so I can try their food. Not that many though. I think one is called Quintessence.